A pioneering predictor tool developed by the University of Sheffield will give scientists an alternative way to visualise the world and help to forecast the impact of climate change, population growth and energy use. The Supply Chain Environmental Analysis Tool (SCEnAT) 4.0 uses large scale databases – including from the World Bank and NASA Satellite maps – numerical, graphic and textual data with embedded autonomous learning. The new tool will be able to predict the relationship between climate change, political economy, innovation, life expectancy, population growth and energy use, on sustainable development and resources. The University of Sheffield, in collaboration with Microsoft, has been working for the past eight years to solve the global challenge of depleting resources. The new tool has been pioneered through the University’s Advanced Resource Efficiency Centre (AREC) by Professor Lenny Koh. “We are very proud of the long standing relationship between the University of Sheffield AREC and Microsoft,” said Professor Koh, Director of the AREC. “SCEnAT 4.0 is borne from this ongoing collaboration in the era of Industry 4.0; and the Cloud and AI economy. SCEnAT 4.0 AI capabilities fit strategically with the AI sector Deal announced by the UK Government. SCEnAT 4.0 has evolved from the original SCEnAT Cloud based tool, powered by Microsoft Azure, which has helped companies reduce the environmental impact of their supply chains. The collaboration between the University of Sheffield and Microsoft progressed the tool into SCEnAT+ and SCEnATi – funded by the EU – which has the addition of big data analytics and benchmarking capabilities along with Power BI integration, a Microsoft business analytics service. Anthony Bitar, Cloud Solution Architect, Microsoft UK, said: “Policy makers and industry leaders can exploit the prediction experiencer from SCEnAT 4.0 to have a deeper understanding of the implications of policy and investment decisions. Debates about the role and importance of the arts as a social good have never been more keenly felt than in recent years. At the local level, current debates about the death of the high street are linked to the loss of community as well as equity, with the potential solution that empty shops be used for artist’s spaces and local theatre. Initiatives such as Theatre Delicatessen in Sheffield, remind us that local and national governments accept that the provision of cultural and community arts spaces remain vital to shaping identity, a sense of community and belonging, yet they do so in increasingly constrained circumstances. The landscape for local, national, and international art and artists’ spaces has changed considerably in recent years and is continuing to change, as arts organisations and initiatives are increasingly being, and indeed required to be, mission-driven. ‘Mission-driven arts organisations’ we can define at an umbrella term that brings together diverse organisations and initiatives that pursue both social and artistic or cultural objectives. Thus, mission-driven arts organisations are diverse and employ numerous organising forms, such as social enterprises, co-operatives, social movements, temporary organisations and initiatives. However, at their core is the pursuit of social objectives, which also requires the management of often conflicting artistic, economic, cultural, and social demands. In this context, artists’ lived experiences are marked by tensions and contradictions as they negotiate precarious careers, and develop their creative and artistic values within a challenging marketplace. A question that might be asked here is whether artists value in this context is determined by engagement, or to put that another way conforms to the values of funders. Can artists thus survive, and thrive on the ‘outside’? This topic has rarely seemed more timely or worthy of debate as we experience a point of rupture within wider society as the intersection of globalisation, nationalism, and neoliberalism creates multidimensional uncertainty that shapes the opportunities, responsibilities, work arrangements, and lived experiences of artists, artist-led initiatives, and cultural organisations. The resultant limited access to funding with shifting priorities, market fragmentation, and public policy place demands on arts organisations and initiatives to change their business models and become more ‘entrepreneurial’ and ‘resilient’. For this special edition we aim to try and make sense of how artists and mission-driven art organisations navigate the uncertainty of contemporary artistic careers in the context of the social, economic, and technological uncertainty of our times? This question is not only timely from a practice perspective, but also creates an opportunity for dialogue between rapidly growing, yet fragmented, research streams across the cultural and creative industries. This issue will provide an opportunity for a vibrant conversation that for the first time brings together different viewpoints to understand how artists and arts organisations cope with and thrive in today’s uncertainty to catalyse positive social change, while meeting economic demands. The overarching theme of this special edition is to understand how rupture and complex and rapid change impacts on support for art, artists, and artists’ spaces and in doing so to provide cutting-edge insights relevant for contemporary theory, practice and teaching. It is in this spirit that we are calling for papers that shed light on the foundations and nature of mission-driven art organisations and initiatives across levels of analysis: from individuals and organisations to communities and institutions. Management School PhD students are set to benefit from an investment of over £1 million to improve the Doctoral Research Centre, in a bid to further boost student experience and enhance the School’s professional research environment. The latest addition to the facilities at Sheffield University Management School includes completely refurbished working and social spaces for PhD students. The Doctoral Research Centre, as it will be known, is located on Northumberland Road and has been designed to provide an exceptionally high-quality environment for its users. The makeover provides students with world-class facilities and a professional, flexible working environment that will inspire the next generation of researchers. The improvements made to the building will ensure an enhanced student experience for doctoral students in the Management School. A key focus of the improvement works was on enabling a strong sense of community to flourish among students. To meet these needs, flexible working spaces such as hot-desking and silent study facilities were created and the building is equipped with improved accessibility features. The improved infrastructure will encourage productive collaboration between students. The refurbishment stands as a tangible example of the School’s commitment to improving its students’ experience and as a Triple Crown Accredited institution lives up to the exacting standards expected of an elite, world-class management school. “I am delighted that our students will benefit from an investment of over £1 million in facilities designed specifically for PhD students and their research”. “The creation of the Doctoral Research Centre and its focus on developing communities of researchers will help the Sheffield University Management School continue to thrive as an international centre of research excellence”. “These new facilities give us the environment and space we need to continue to develop the next generation of scholars”. “The new upgrade has brought to our Doctoral Centre a fresh modern look with an up-to-date professional environment, creating a collective surrounding that facilitates mutual collaboration and support. I feel privileged and very comfortable here”. Scientists and engineers in the UK are working to use ideas from advanced space technology to improve the lives of farmers and reduce food waste in developing countries. Due to a warmer climate and a lack of technology, expertise and infrastructure, up to 40% of food in developing countries can be wasted, with much of this waste being fresh produce. This is because the farmers are unable to insulate and cool or refrigerate produce after it is harvested – and on the journey between the farm and the consumer, the food can become spoiled. A research team, led by Dr Sonal Choudhary of the University of Sheffield, is working on utilising the Science and Technology Facilities Council’s (STFC) expertise in space science and cryogenics, thermal engineering and analysing large datasets to improve the efficiency of the cold food supply chain in India and so reduce the amount of waste, both in terms of food and energy. The project is being undertaken as part of STFC’s Food Network+ research programme. UK expertise in cryogenics, the science of extremely cold temperatures, and of thermal engineering could hold the key to bolstering the food chain by reducing the amount of loss from farm-to-fork and by doing so, helping farmers raise their income. The project has been funded by the STFC Food Network+, which brings together researchers from STFC and different disciplines in the agri-food sector with the aim of solving some of the world’s greatest food sustainability challenges. The team have utilised participatory workshops and focus groups to predict any challenges in implementing STFC space science and technologies in India, where the gaps in the infrastructure exist, and what interventions are needed at different stages of the food supply chain from farmers to retailers and end consumers. The team is made up of both academia and industry, with representatives from the Sheffield University Management School (SUMS), Hull University Business School (HUBS), STFC’s RAL Space and commercial cryogenics firm Cryox. The University of Sheffield will lead a €4 million research project and train a new cohort of thought leaders to drive the transition towards a more sustainable mode of production and consumption in Europe over the coming decades. Realising the Transition to the Circular Economy (ReTraCE) is a research project funded by Horizon 2020 EU’s Marie Skłodowska-Curie Innovative Training Networks and will support the implementation of the European Commission’s Circular Economy strategy. A circular economy is an alternative to a traditional linear economy (make, use, dispose) in which we keep resources for as long as possible, extract the maximum value from them whilst in use, then recover and regenerate products and materials at the end of their useful life. The project will bring together world-leading experts from a wide set of beneficiaries and partners to achieve breakthroughs in understanding how the transition towards a circular economy can be realised – both within existing organisations and industries as well as through innovative and sustainable business models. “This project will directly facilitate the implementation of the recently adopted ambitious Circular Economy strategy of the European Commission, which is closely linked to Sustainable Development Goals – the blueprint to achieve a better and more sustainable future for all. The consortium of ten beneficiaries is led by the University of Sheffield and includes seven academic and three non-academic groups: The University of Kassel (Germany), Parthenope University of Naples (Italy), Olympia Electronics S.A (Greece), Tata Steel (UK), University of Kent (UK), ABIS – Academy of Business in Society (Belgium), Dalarna University (Sweden), Rotterdam School of Management, Erasmus University (Netherlands), and SEERC – The South-East European Research Centre (Greece). The network will design and deliver world-class multidisciplinary training to 15 early stage researchers, offering them an extended and valuable program of international exchanges and secondments through a wide network of partner organisations – from public, private and third sector. The multi-disciplinary project will draw upon research that will advance the current understanding of the circular economy from economic, environmental and social perspectives, providing policy insights and implications for practice. It is envisaged that, by the end of the project, early stage researchers will be employable by research institutions, public sector bodies and within a wide range of manufacturing and service industries which will require new professional profiles for realising the transition towards the circular economy. The project has a call for applications for 15 Early Stage Researcher positions funded by the EU H2020-MSCA-ITN-2018 scheme. Find out more about the project on their Twitter and Facebook pages. A major new research project led by the University of Sheffield will help mid-sized law and accountancy firms adopt artificial intelligence and machine learning technologies to improve productivity. A team of researchers, led by Professor Tim Vorley from the University of Sheffield’s Management School, is one of three successful bids to the Industrial Strategy Challenges Fund (ISCF) Next Generation Services call. The research, commissioned by the UK government, will focus on helping people adopt new technologies. Professor Vorley will lead a team of colleagues from the University of Sheffield; Lancaster University; Manchester Business School; The University of the Arts, London; as well as non-academic partners the Managing Partners’ Forum and Normann Partners. The project, Innovating Next Generation Services through Collaborative Design, will focus on firms that are cautious or uncertain over how to implement technological change. Rather than focusing solely on new technologies, the research will involve exploratory prototyping of solutions designed in collaboration with firms to enable a rapid generation and assessment of potential future applications of artificial intelligence across businesses. This is critical if adoption within sector firms is to be broadened. The services sector accounts for almost 80 per cent of the UK economy, with professional services the largest sub-sector representing 11 per cent of GDP. Professor Vorley said: “Understanding the transformative potential of AI involves looking at individual firms, the outcomes provided to clients, and the business processes and predictions that are deployed. Business Secretary, the Rt Hon Greg Clark MP, said: “The UK is the home of AI – from Alan Turing’s pioneering work to today’s growing use of AI throughout the economy. Artificial Intelligence is changing how we work, live and play. Brexit negotiations may be the only news for the UK in relation to the European Union, but it is very much business as usual in the European Parliament. 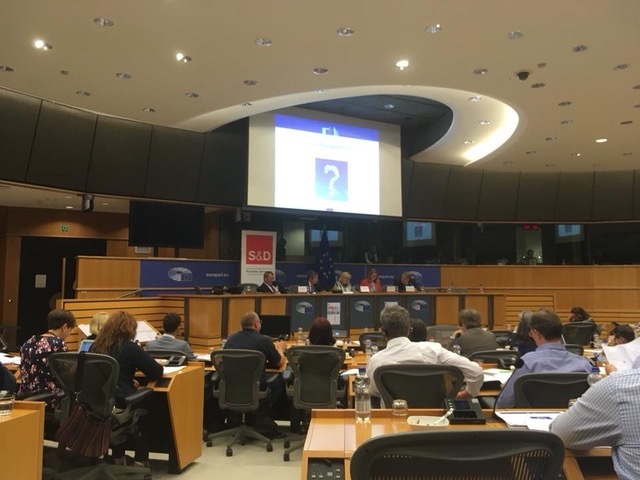 Colin Williams, Professor of Public Policy in Sheffield University Management School (SUMS), was invited on 6th June to discuss the proposal for a European Labour Authority in the European Parliament. The European Labour Authority aims to ensure that EU rules on labour mobility are enforced in fair, simple and effective way. It was announced in September 2017 by the president of the European Commission and on 13 March, the legislative proposal was presented as part of the roll-out of the European Pillar of Social Rights. It is proposed that the Authority will be up and running in 2019 and is expected to reach its full operational capacity by 2023. Invited by the Progressive Alliance of Socialists and Democrats in the European Parliament (S&D Group), the second largest grouping of MEPs in the Parliament, Professor Williams made the case for a real and effective European Labour Authority able to enforce labour and social rights and ensure rules on labour mobility fairly. Drawing upon his experiences as lead expert to the European Commission’s European Platform Tackling Undeclared Work, he called for a greater focus in the legislative proposal upon developing the capabilities and capacities of Member States to tackle labour abuse and enforce workers’ rights. He also called for a shift away from solely dealing with labour abuses after they occurred and towards preventing them from happening in the first place. Professor Williams shared the platform with the Confederal Secretary of the European Trade Unions Confederation (representing 45 million members), and the European Commission official responsible for the legislative proposal. The debate was live-streamed and interpreted in five languages. Professor Lenny Koh, Director of the Advanced Resource Efficiency Centre (AREC) at Sheffield University Management School, co-authored the report with Charles Carter, TSC. Blockchain could provide the underpinnings for a future integrated transport system, without the need for large and costly centralised control mechanisms, according to a new paper from Sheffield University Management School and the Transport Systems Catapult (TSC). The TSC is calling for government and industry to explore the technology’s potential uses in transport to ensure the UK stays ahead of latest developments. Blockchain is a Distributed Ledger Technology, which is a special type of distributed database. Each computer ‘node’ or member in a network stores an identical ‘ledger’ or database. This database takes the form of a chronological chain of unique groups of information called ‘blocks’ which are securely linked together using cryptography. The University of Sheffield and TSC report found that, whilst currently the technology is still some years from full maturity, synergies exist in areas like freight and logistics, autonomous vehicles and mobility as a service, where the technology could be applied in the future. This is because these areas will involve multiple businesses with potentially competing interests, who require trust and transparency to share data and work together seamlessly – which plays to the strengths of Blockchain. In one example, the report highlights that the decentralised nature of Blockchain could provide an alternative future for mobility as a service business model, where transport is supplied on demand to subscription customers. Blockchain could help avoid the situation where centralised platforms come to control service provision and data leading to minimal competition. Instead it could facilitate a decentralised network of transport operators by providing built-in trust, consensus and immutability in data and information sharing. Passengers could also have greater control over their personal data. Professor Lenny Koh, Director of Advanced Resource Efficiency Centre (AREC), at Sheffield University Management School, added: “Our transport systems and their wider networks and supply chains are increasingly digitalised. 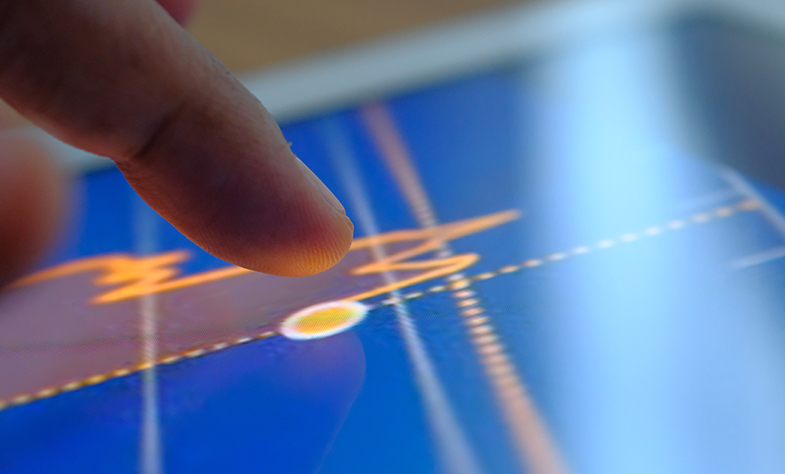 The traditional ways of managing transactions and resources in order to provide frictionless processes, mobility, products and services to users are no longer efficient. In this partnership between the Transport Systems Catapult and the University of Sheffield, we have explored the potential of Blockchain to address these challenges. Discussing the report, TSC Chief Technology Officer Mark Westwood added: “The TSC’s unique neutral and trusted position allows us to provide a balanced voice against the positive and negative messages around Blockchain through this report. We need to help decision makers understand the potential benefits and limitations of Blockchain technology. It is also important to analyse potential use cases to find out if Blockchain is a good fit, or if other technologies could provide a better solution. The TSC is calling for the government’s Industrial Strategy Challenge Fund to support future mobility through the launch of a dedicated R&D programme, collaborating with the transport services industry to build demonstrators of new mobility services. This will enable new service models and technologies such as Blockchain to be tested in-market, creating economic growth for UK based companies through reducing time to market. Professor Colin Williams of Sheffield University Management School has been appointed to advise six countries in the West Balkans on their accession to the European Union from 2025. Prof Williams will provide advice on the development of strategies for tackling undeclared work in six countries; Albania, Bosnia & Herzegovina, Kosovo, FYR Macedonia, Montenegro, and Serbia. Brexit may be the hot news in the UK but other countries in Europe recognise the advantages of EU membership and are actively seeking to join the EU family. Colin Williams, Professor of Public Policy at Sheffield University Management School, has been appointed to advise six countries in the West Balkans on their accession to the European Union from 2025. The appointment of Prof Williams follows a keynote speech he delivered at the first European Commission conference in the West Balkans region in January 2018, on the subject of boosting the social dimension. Working with the Regional Cooperation Council, the objective of Professor Williams is to align the strategies towards tackling informal employment in these six countries with the approaches being adopted in the European Union. If achieved this will facilitate their smooth accession, by demonstrating how they are already adopting the good practices being pursued in the EU member states. Professor Williams will provide advice on the development of strategies for tackling undeclared work in the six countries. As Professor Williams comments, “cash-in-hand or undeclared work is the equivalent of some 25-35% of GDP in these countries, and effective strategies need to be put in place to smooth the accession process into the EU”. Following an initial diagnostic report and the production of a roadmap for each country, the second and much more arduous stage will entail seeking ‘buy-in’ from the governments and social partners in each country. In 2010, Prof Williams undertook a similar exercise prior to the entrance of Croatia into the EU. In 2016, Prof Williams successfully negotiated one of the four ‘bailout conditions’ with Greece, helping them develop a strategy to tackle their large undeclared economy. From 2013-2017 Prof Williams was Principal Investigator on a £1.2 million Marie Curie Industry-Academia Partnerships Programme grant to develop the capacity and capability for tackling undeclared work in the region. Comment: Context and theory on SMEs going international – where now for internationalisation research? 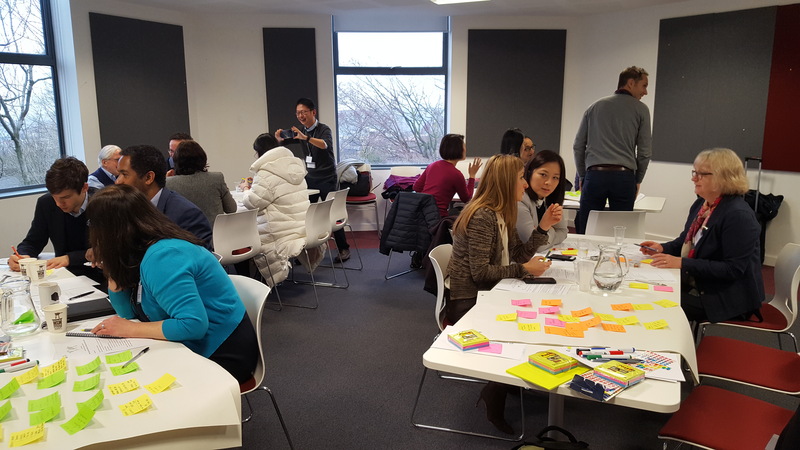 In January researchers from the University of Sheffield; Melanie Hassett, Marian Jones and Tina McGuinness, hosted a sandpit event on the internationalisation of SMEs (small and medium-sized enterprises). During the event we engaged in conversations with academic guests from the Universities of Birmingham, Glasgow, Edinburgh Napier, Sheffield and SOAS University of London. Our open forum focussed our minds on what internationalisation is in the 21st century. Our aim for the sandpit was to build and consolidate a network of scholars with interests in SME participation in international business. Starting with a video featuring almost 100 photographs of the current world; of climate change, artificial intelligence, pollution, sustainable energy and human crises (natural disasters, wars and economic and social migration). We turned our discussion to how the changing contexts of international business should influence our research questions. A recurring theme from our tables was the extent to which the voice and experience of entrepreneurs and managers involved in internationalisation are not reflected in our research, and how findings on the lived experience of internationalisation are conveyed towards policy. Over the course of the afternoon we explored the relevance of extant theories of international business. We questioned whether the dynamic context of the business world post-globalisation calls for new theories, novel research, and qualitative, holistic and interdisciplinary approaches to tackle questions about the societal impact of IB. We would like to thank everyone who participated. We aim to continue the conversation through a series of sandpits with academic and practitioner participation to better understand how confidence, capabilities and connections contribute to successful SME internationalisation. Thank you to the SAMS (Society for the Advancement of Management Studies) for the research grant enabling this sandpit to take place. Posted in Comment, Research | Comments Off on Comment: Context and theory on SMEs going international – where now for internationalisation research?